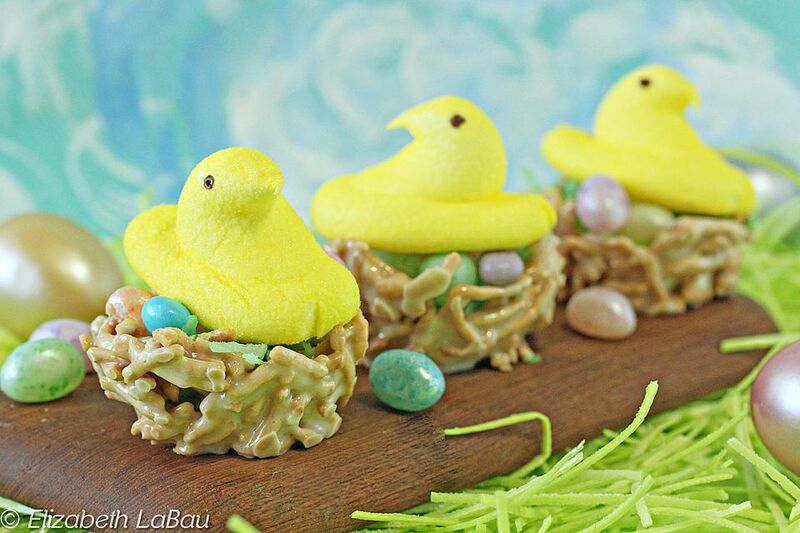 Easter Bird Nests are a fun, easy Easter candy recipe. These whimsical candies are especially good to make with children. If you don’t want to use chow mein noodles, you can substitute approximately 3 cups of cereal—twig-shaped cereals will work best, but crisped rice or cornflakes will taste great too. Prepare a muffin tin by spraying it thoroughly with nonstick cooking spray. In a large microwave-safe bowl, combine the marshmallows and butter. Microwave for 1 minute then remove and stir vigorously. If the marshmallows are not fully melted, microwave for an additional 30 to 45 seconds until the marshmallows are melted. Stir the marshmallow and butter mixture until it is smooth and homogenous. Add the vanilla extract and chow mein noodles and stir until the noodles are completely and evenly covered with the mixture. Allow the mixture to sit for a few minutes until it is cool enough to handle, but still warm enough to manipulate. Using a large spoon, evenly divide the chow mein noodles among the 12 muffin tin holes. Spray your hands with nonstick cooking spray, and mold the noodles into a nest shape, indenting the center and pressing the edges up the sides of the tin. Sprinkle the coconut on top of the nests. Add two or three eggs to each nest, and top them with a Peep. If you are going to be transporting these, you can melt a few chocolate chips and use the melted chocolate to secure the eggs and Peeps to the nest. Otherwise, you can leave them loose and allow people to eat them piece by piece. Allow the marshmallow mixture to completely set before removing the nests. To remove them, slide a knife around the sides of the tin and gently insert it under the bottom of the nest to pull it out. These nests are best at room temperature. They can be kept in a wax paper-lined Tupperware container for up to a week, but the Peeps will get stale quickly, so add those at the last minute if you are making these in advance.